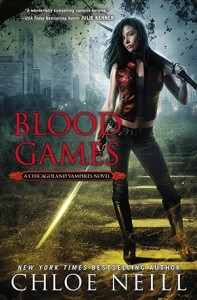 BLOOD GAMES is the tenth book in Chloe Neill’s Chicagoland Vampires series. Things have settled down a bit after the events of WILD THINGS, and vampires are once again seen as something cool by some humans. Someone is murdering people in a way that suggests there is a supernatural connection, and Merit finds herself investigating. Meanwhile, things are afoot in the vampire world. BLOOD GAMES is a good addition to the Chicagoland Vampires series as it sees the continuation of the vampire politics that have been occurring in recent novels in the series. Neill also adds a murder mystery for Merit to investigate, which adds to the tension of the book. The overall plot of the book was a bit choppy and change-y; although the murder mystery tied the whole book together, the vampire politics provided several different threads which seemed to jump about as if Neill wasn’t quite sure which track she wanted to take the book down. That being said, as always I enjoyed having Merit as the book’s narrator. I also enjoyed the way Neill treated the romance aspect of the book. The return of familiar faces was brilliant – I loved the scenes with Merit and Mallory, their friendship is one of the things I really enjoy about this series. Neill wrapped the mystery aspect of the book up well, and I really enjoyed watching that particular plot fall into place. Having said that, the ending of the book left me feeling that this book was pretty much written to set up the next book in the series. I’m not totally sure how I feel as a reader about that. On the one hand, I’m glad Neill is laying groundwork for things to come in the series. But, on the other, I would have liked this book to have felt a little more solid and as if it had a more equal weight in the series. I did enjoy reading the book and finding out what was going on with Merit and Ethan, and I do think the book adds to the series. I await the eleventh book with interest.